You are here: Home / Featured / Are These The Dave Tippett Phoenix Coyotes? Are These The Dave Tippett Phoenix Coyotes? If you liked it then share it. Dave Tippett is an extremely intelligent hockey man and a very good head coach. AND I know he doesn’t need me questioning his hockey team because what I’m about to ask has probably run through his thoughts about a thousand times this season. Can this team be a Dave Tippett style hockey team? Part of being a good head coach is realizing you can’t fit a square peg into a round hole and vice-versa. The Phoenix Coyotes are morphing into a different type of team right before Coach Tippett’s eyes and I’m not sure there is much he can do about it. I know he doesn’t like the fact that his team is giving up more goals but I’m sure he is happy that they are scoring at a higher rate than at any time during his Coyotes tenure. They have also shown resilience and a penchant to fight back from third period deficits. Dave Tippett was an early proponent of offensive zone time possession vs time spent defending long before the fancy stat (“Corsi” and “Fenwick”) crowd were around. The following excerpt is like the Holy Grail to the fancy stat disciples because it backs their theory about possession being the key. This is not a great revelation to hockey people or any hockey fan. Having the puck is obviously better than not having the puck. 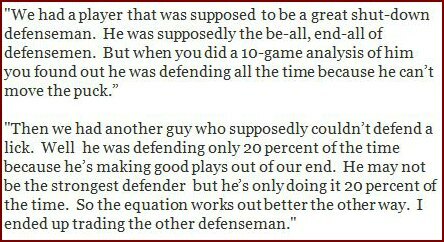 This is Dave Tippett talking about an unnamed defenceman early in his coaching career. The Phoenix Coyotes defence corp is getting a little top heavy in skill and a little short on grit. Derek Morris is arguably the Coyotes most physical defenceman but this sixteen year veteran can’t be expected to do all the heavy lifting. With Rusty Klesla being out of the Coyotes line-up more often than not lately, this leaves Dave Tippett a defence corp of Morris, Ekman- Larsson, Yandle, Schlemko, Stone, Rundblad, Murphy and Michalek. Individually these are all fine defencemen that bring different attributes to the table but as a group they are not going to strike fear into the hearts of their opponents. I believe the Phoenix Coyotes forwards have enough “grind” in their game as a group to implement a Dave Tippett style game. During an eighty-two game season this team is probably okay BUT are they okay in a heavy, best of seven series against Los Angeles? Now don’t get me wrong, I’m not saying the Phoenix Coyotes can’t win with these players ~ au contraire. They just might not be able to win like the old Coyotes ~ “Hockey The Hard Way.” Is Coach Tippett okay with that and is he willing to let this team try to reach the next level by playing a little more wide open style? Now, I said a little more wide open. I’m not a big believer that a race to ten every night is the recipe for success either. The Chicago Blackhawks made it work two of the last three seasons but I still think that is more the exception than the rule. The Bruins, Kings, Devils, Red Wings, Penguins, etc. have proved over the years you need a blend of skill and grit to win the big prize. The Phoenix Coyotes will need to find that happy medium to achieve the success they are looking for. The great thing they have going for them is they have the right guy behind the bench to figure it out and a G.M. that will get the needed parts of the puzzle when required. The question still remains. Can this team be the “Dave Tippett” Coyotes? 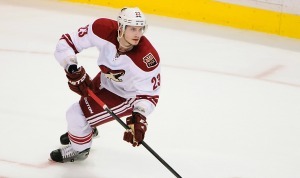 Who should be the next Coyotes captain?